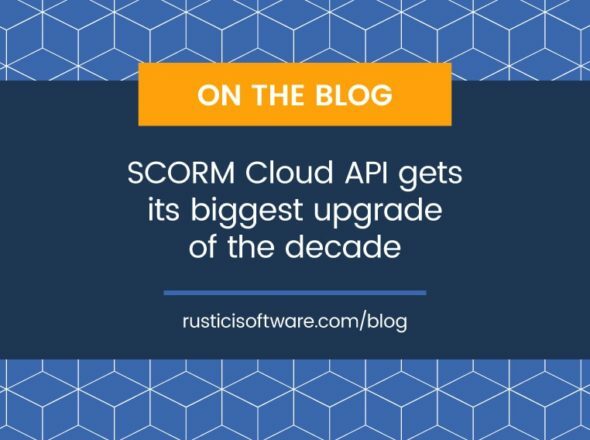 The release of SCORM Cloud’s v2 API is a pretty big milestone for Rustici Software; for the first time ever, Rustici Engine and SCORM Cloud have the same API. We think this is exciting for a few reasons, which I’ll get to, but first I want to share a bit about how we arrived at this point. SCORM Cloud’s v1 API was introduced in 2009, and has been heavily used and refined over time. When we decided to replace Engine’s traditional integration layer with a web service API in 2015, one of our goals was for it to offer the same functionality as Cloud’s API. However, best practices for web services had changed a lot in the six years between, so Engine’s modern RESTful API was a significant departure from SCORM Cloud’s XML-based RPC design. Shortly after the release of Engine 2015.1, we began work to bring the Engine API over to Cloud. We soon discovered that some of the decisions we had made about the API’s design and implementation made a lot of sense for Engine and its customers, but weren’t an exact fit for Cloud. By 2018, we’d learned enough from the work the Cloud team had done and from three years worth of feedback from our Engine customers to design a new version of the Engine API, which we released in December as part of Engine 2018.1. That API is now also available in Cloud. So now Rustici Engine and SCORM Cloud have the same API. What does that mean? It also means that an application written using the Rustici Engine v2 API will work with Cloud’s v2 API, without changing any code or client libraries. Going in the other direction, from Cloud to Engine, may require some changes if your application uses features that are only available in Cloud, such as invitations and tagging. Having the ability to write a single application that can integrate with either SCORM Cloud or Rustici Engine introduces a lot of flexibility for existing users of either system, and removes technical hurdles for new users who want to take a “crawl, walk, run” approach. For existing SCORM Cloud API users, transitioning your application to the v2 API not only gives you access to new functionality, now and in the future, it also makes it possible to move your application from our SaaS platform to a self-hosted solution, or to take a hybrid approach. For example, you could serve the majority of your customers with Cloud, and use a hosted Engine instance for a client with special data-handling requirements. If you’re evaluating whether Rustici Engine is the right solution for your eLearning application, the v2 API in SCORM Cloud provides an easy path forward. Sign up for a free trial account and start work on your proof of concept application right away. Already made the decision to buy Engine, but are waiting for the procurement process to finish, or for your hosted environment to be set up (by the way, we can make that happen fast with our Managed Hosting Services)? Your developers can get a head start with the Cloud API while you wait. The code they write using the v2 API in Cloud will continue to work once they have access to Engine.